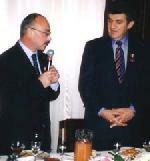 On October 6 and 7 the World Armenian Organization held its founding convention in Moscow. The ADL was among the few Diaspora organizations, which sent a delegation to the convention, comprised of Edmond Azadian, Vice Chairman, and members Hagop Vartivarian and Panik Keshishian. Also accompanying the delegation was Papken Megerian, Chairman of ADL Eastern District, and Varoujan Sirapian, Chairman of ADL France. On behalf of the ADL, Edmond Azadian was asked to be one of the speakers at the opening session of the convention, which was held in the Convention Hall of the Kremlin in Moscow. Attending the opening session were President Putin of Russia and President Kocharian of Armenia. Also present was Foreign Minister Ivanov of Russia and the popular Mayor of Moscow, Louchkov. Edmond Azadian greeted the two presidents, as well as Ara Aprahamian, who had taken the initiative to organize the convention and who eventually became the president of the World Armenian Organization. The following is the text of Azadian's speech, at the conclusion of which, he shook hands with them. "Today Armenians all around the world face a new horizon. The founding convention of the World Armenian Organization heralds a new era in modern Armenian history. The times have been changing rapidly; new conditions develop, new horizons of thinking dawn every day, and new frontiers of science and space are conquered on a daily basis; and as a result, our globe is reduced to the size of a global village. Therefore, all active groups and alert nations react correspondingly to the developing changes and they take appropriate measures to survive in this new world order. During the Cold War era it would have been unthinkable to hold a World Armenian Congress and to begin a new organization, which would attempt to bring all Armenians around the world under one umbrella. It would also have been interpreted in a completely different manner had that convention taken place in Moscow. But fortunately today the divisions of the past have become history; nations have come together to use the resources of the ever-shrinking globe in a more prudent manner. As far as Armenia is concerned, unfortunately the Cold War continues in that region, blockades and threats of new conflicts are directed towards Armenia, which always observes a very cautious policy towards the impending threats. Today the entire world, and especially former adversaries, understand that Armenia has a very special historic relation with Russia, determining the fate and continuity of our homeland. During the past centuries leaders like Nerses Ashtaragetzi, Israel Ori, Lazarian family, Nalbandian, and Abovian have always directed their eyes towards the friend in the north in the hope of preserving the tiny Armenian homeland, and they have never been disappointed. In modern times leaders like Ara Aprahamian symbolize that orientation and policy, and we hope again that the favorable precedents of history will be repeated also in our own days. The 20th Century witnessed many bloody conflicts, and Armenians inherited the goriest genocide at the beginning of the century. Our people have not been yet emancipated from the psychological and practical fetters of that trauma. The Armenian genocide still has not been appropriately recognized, nor has retribution been made to the survivors, while our historic lands still are occupied under the arm of the perpetrators. Additionally, the cultural genocide continues even today from Nakhichevan to Ani and Van without any interruption. The 21st Century brings new thoughts and new vision and new projects to the Armenian people, so that, as a nation, we can release ourselves from the burdens of history and keep pace with the march of the modern nations. Along with the legacy of the genocide, Armenians have inherited the tradition of disunity, which was forced upon them over the centuries by the occupying powers. This convention is a bold move to bridge those divisions to bring the different groups together, and once again to give the inspiration of a whole nation to disparate factions of our people. During their long and arduous history, Armenians have always given potentates, generals, and also intellectual leaders to the Byzantine, Persian, Ottoman, Tzarist, and Soviet empires, but they have always felt meek in their own homeland. Unfortunately, Armenians have refused to be led by other Armenians. Today is a historic stage where Armenians should lead Armenians, Armenians should complement each other, and they should come together to pursue projects of paramount significance. We have already begun to take our revenge from the destiny forced on our people, first with the independence of our homeland, and then with the victories, which we have recorded in Karabagh, and also with the achievements that are in store for us, as we come together and strive to achieve common goals in the near future. It may happen that all the pa rticipants of this historic convention have brought very little to the convention, except their concerns and willing Armenian souls, but the most important issue is what we will be taking away from this convention, so that we can build bridges uniting Armenians on different continents and different countries, and we can look to the source of our inspiration, which is our newly independent Republic of Armenia. At this time we cannot sit on our hands and watch opportunities pass by. It is time to come down off the fences and give a helping hand to the magnificent initiative, which takes shape today. Let us come together and contribute to the new movement with the brilliant hope of tomorrow; and let us always remember that a ten thousand mile march begins with the first step. 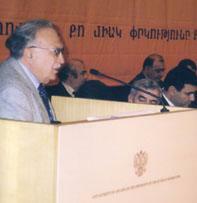 On October 6 and 7 the World Armenian Organization held its founding convention in Moscow. 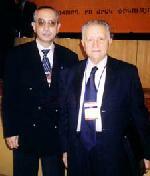 Over 300 delegates from 52 countries attended the convention. Vladimir Putin adressing the WAO delegates and guests. admirers from Jordan's King Hussein to Hollywood's Arnold Schwarzenegger.